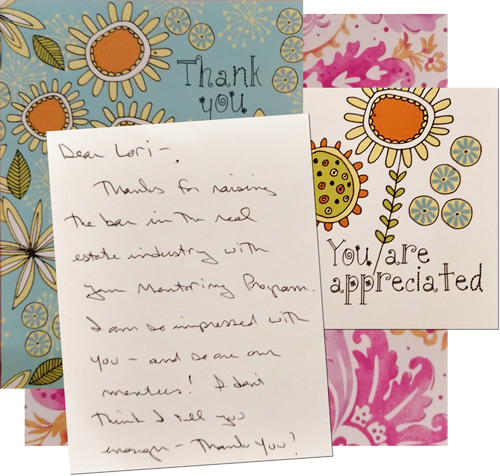 "Lori provided a flawlessly executed real estate transaction from start to finish. My first impression was that Lori was a very warm and friendly person; we soon discovered that she was also completely honest, efficient, and shrewd in her bargaining on our behalf. Furthermore, she was on vacation for a period right after we put a contact on this house, and her associate Dana was in charge when Lori was gone. 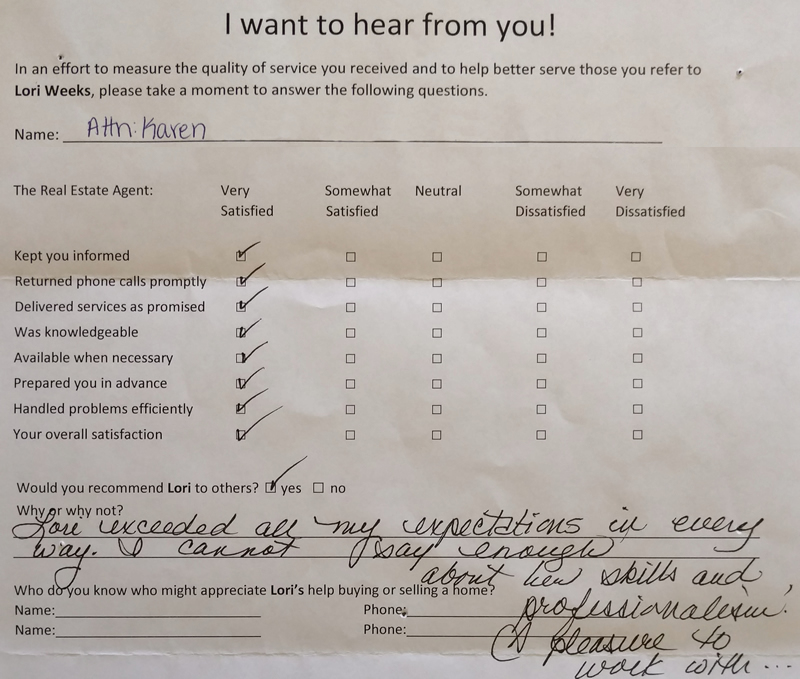 Dana treated our requests as if we were her own client and could not have been any more helpful or efficient. We were in the market for a small place where my husband could stay during the week, rather than having to drive daily from Louisville to Fort Collins. We were lucky enough to find the perfect place right away, but it was also perfect for 5 other potential buyers who submitted bids. The seller would have liked to make a ddal without an appraisal but Lori counseled us to stick with getting an appraisal and to set a minimum price on that. This showed we had some flexibility but it also protected us. feel that we got the bid without placing ourselves in a situation where we overpayed because we followed Lori's advice. Not only did we end up with the contract, the price we paid was significantly under the price at which the house was assessed. Happy story! Thank you Lori and Dana!" 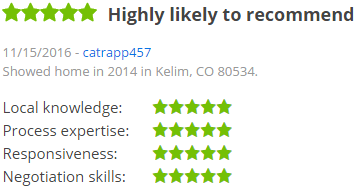 "Lori did an excellent job!!" 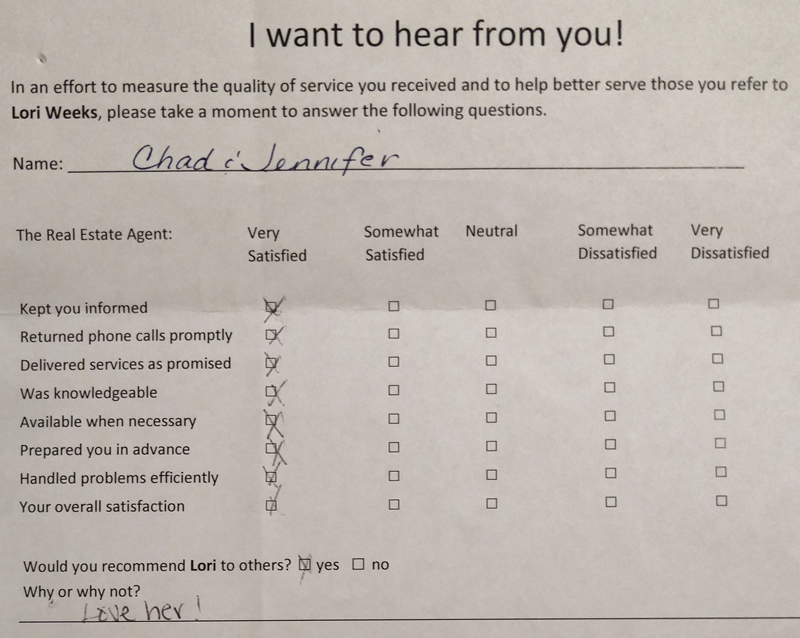 "When we decided to sell our home in Fort Collins, there was only one choice to make regarding which realtor we would use. Lori Weeks had sold us the same home we were now selling six years ago. Because of the professionalism Lori extended then, we were confident she would be the right choice. Lori presented her marketing plan along with a suggested asking price. We were a little skeptical about the higher sell price, but being from out of the area, we trusted Lori. She provided us with a home staging expert to give us tips. She gave us a preferred vendor list to help with things such as mechanical systems service, carpet cleaning and etc. She took care of the home inspection. She sent a professional photographer for the listing online. Needless, to say when we had an offer above asking price after the first showing, we were ecstatic. As things proceeded, there were issues with the first offer, but it had nothing to do with Lori. My wife and I highly recommend Lori Weeks for all your Realtor needs." "Mike and I were moving from Michigan to Colorado to live near our son and his family who live in Loveland. Lori asked us for a list of "must haves" and she got to work for us right away. We were hesitant to put "mountain view" on our list, as we thought it would be near impossible considering our price range. I remember Lori saying "If you don't ask, you won't get it!" Since our visits to Colorado were limited, Lori made great use of our time; doing her homework before we arrived. She showed us only the homes that met our must-have list. Lori went above and beyond finding us not just a house, but our beautiful home with a mountain view! Can't thank you enough, Lori!" 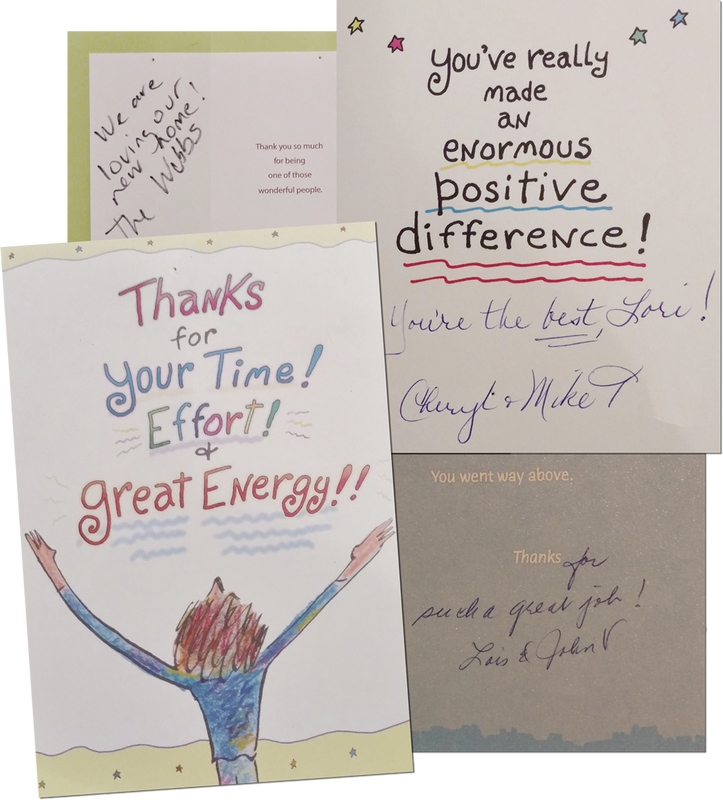 "My wife and I have used Lori's skills both on the selling and buying sides for several transactions over the last few years. She's easy to work with, and outstanding as an agent. What always impresses me is her full-on engagement with any transaction, regardless of the market. She never cuts corners, or takes the market for granted. For example, we've sold two homes in the last few years in what was clearly a "sellers market". Many agents would save a little money on the professional photography or delay the effort of an open house because they would count on the house selling easily based on the market. Lori, on the other hand, marketed both houses as if it were a buyers market, and she had the houses sold within a couple days. In both cases, she engaged a professional stager, hired a professional photographer, held an open house the weekend the house went on the market, and produced high quality full color brochures. These types of details, and the diligence she put into marketing put us in the position of selling quickly with multiple offers to choose from." 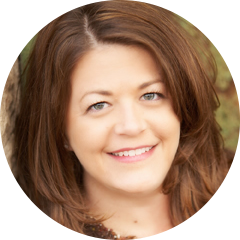 "We met Lori years ago when she was just starting out in real estate. Her very first listing was an investment property that we ended up purchasing. Although we recognized that Lori was new to the business, we knew that she would have a solid career in real estate because she was smart, instinctive, hardworking, responsive and very professional. We decided to use her as our listing agent for the sale of that property and she has been our agent ever since then, brokering a number of real estate deals for us. We have such confidence in Lori that we have referred her to several friends who have conducted multiple transactions with her as well. Currently, we have lived in our home for over 4 years now but continue to remain in contact with Lori about market trends and potential purchases. Lori’s knowledge of the Northern Colorado housing market is vast and her expertise in real estate contracts is impeccable. Over the years our relationship with Lori has blossomed into a true friendship so that when we do refer her to others, we know that we are referring a trusted agent and a friend. If we ever decide to purchase another home or investment property in the area, we are totally confident that Lori will be able to handle the transaction(s) for us seamlessly! 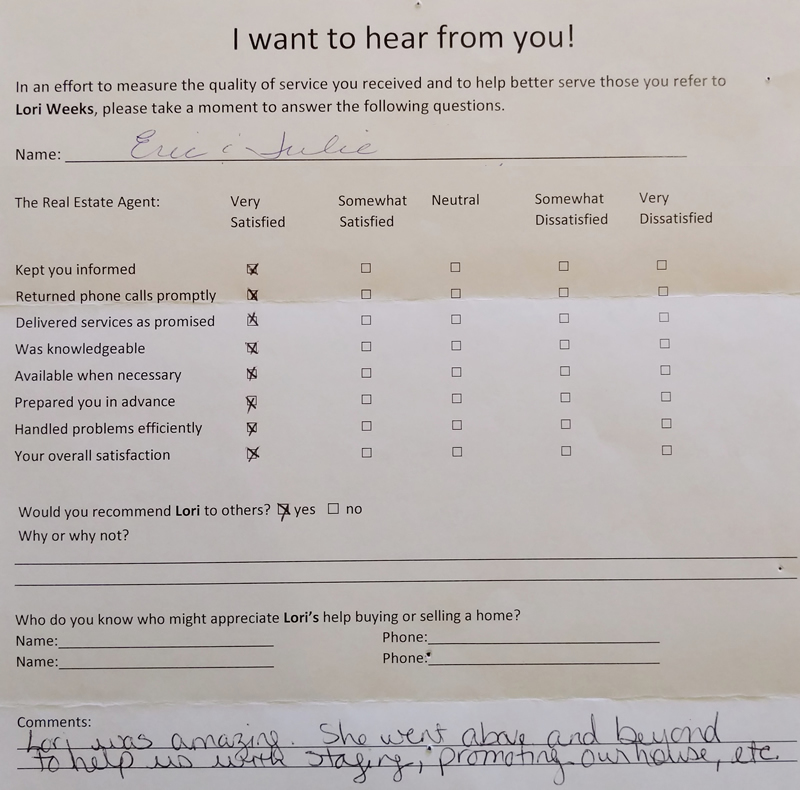 It is without hesitation that we highly recommend Lori’s services to anyone who is interested in buying or selling a home in Northern Colorado!"